My Cozy Corner: I Saw a Bee! How was your weekend? I wanted to share the last Sunflower blooms of the season. 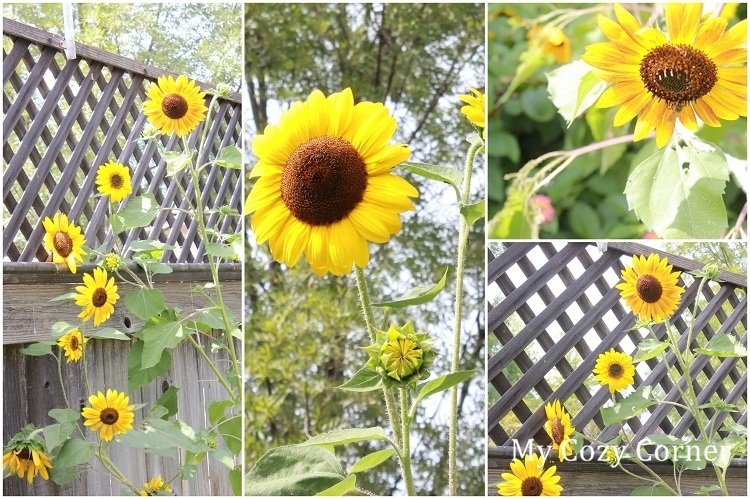 The Sunflowers have been blooming now for over 45 days in my yard. I've seen critters and birds enjoying the seeds. A squirrel has been traveling along the fence feasting on the dried flowers. While watching the entertainment of nature yesterday, I Saw a Bee! I don't usually get to close to bees, but this one was nice and I was able to get a closeup for this photo. Now it's officially fall I can start to do some serious yard work. The weather is cooling down and life is simply wonderful. I'm so excited about moving plants into My Secret Garden Go Here. I will be down on my hands and knees during late October and November trying to get everything in the ground before it freezes. Thank you so much for visiting My Cozy Corner, while I act up and have a little fun writing about my Joyous Life. On another note. Update regarding my mother. Sweetheart and I took a trip to see my mom in the hospital Thursday. Around five in the evening she was transported to a skilled nursing facility. Because of her stroke of 20 years and her age 91, she was a little tired. My sister and I are pleased with the care she is receiving and she seems content for awhile. She will receive physical and occupational therapy and be back in her own home in a few weeks. She has a smile on her face and is eating and resting. I will be joining some wonderful bloggers this week so stay tuned. Oh that's radio talk. LOL! Thank you again for joining me as I jump from party to party. Hope you have enjoyed looking at my big bee!